US extrusion sheet manufacturer Processing Technologies International (PTi) has sold a sheet extrusion system to Aserpet, based in Gaziantep, Turkey, a PET recycler and soon-to-be manufacturer of PET sheet roll stock. The recently completed sale is PTi�s first in Turkey. Aserpet, a recycler of PET flake for the packaging industry, purchased its first sheet extrusion line to help support the company�s entrance into the packaging industries. The PTicoextrusion system, which runs 750 kg/hour of PET, also includes a roll stand, winder, and stacker. 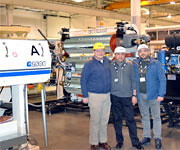 The machine has been installed and is up and running at the Aserpet facility. PTi sold the machine through its agent Kerem Anil with Plast-teknik in Istanbul. The company is exploring other business opportunities in Turkey, targeting PET, PP, PS, and barrier sheet extrusion systems for the packaging industry.